After watching Secretary of State Hillary Clinton’s interview about the State Department’s release of their Country Reports on Human Rights Practices for 2010, I had to blog about this important annual publication. In its 35th year for 2010, Country Reports on Human Rights Practices are Congressionally mandated reports produced by the U.S. Department of State that provide encyclopedic detail on human rights conditions in each of the 194 countries that are members of the United Nations. The 2010 version available from GPO is a two-volume set that provides an overview of the human rights situation around the world as a means to raise awareness of human rights conditions, in particular as these conditions affect the well-being of women, children, racial and religious minorities, trafficking victims, members of indigenous groups and ethnic communities, persons with disabilities, sexual minorities, refugees, and members of other vulnerable groups. Grouped by region, the country reports detail the situation in each member nation, and the set also provides an introduction and preface describing overall trends as well as detailed appendices. With the end of World War II, and the creation of the United Nations, the international community vowed to never allow atrocities like those experienced during the war to happen again. 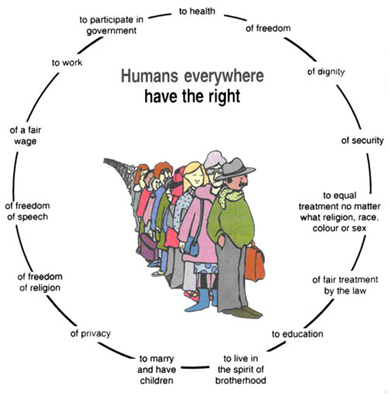 World leaders decided to complement the UN Charter with a road map to guarantee the rights of every individual everywhere, with the resulting document becoming The Universal Declaration of Human Rights. The Country Reports also serve as a progress report in relation to previous years by outlining which countries are improving and which are backsliding as far as human rights are concerned. The 2010 reports praise Colombia, Guinea, and Indonesia for their marked improvements shown that year, and notes Ukraine for backsliding. Check the book for details on each country’s status. 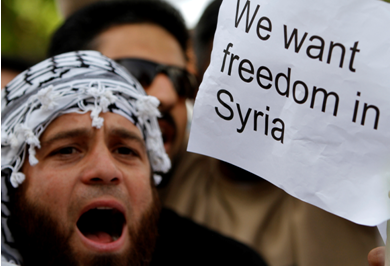 Image: Human rights protestor in Syria holds sign in English aimed to worldwide audiences and media. Source: My San Antonio blog. Further information on all three of these trends is more fully documented in the Introduction to this year’s report, as well as in specific country reports. The Country Reports on Human Rights Practices for 2010 outlined the negative trend of the continuing escalation of violence, persecution, and official and societal discrimination of members of vulnerable groups, often racial, religious, or ethnic minorities or disempowered majorities. In many countries this pattern of discrimination extended to women; children; persons with disabilities; indigenous; lesbian, gay, bisexual, and transgender (LGBT) persons; and members of other vulnerable groups who lacked the political power to defend their own interests. For example, the report notes that there is increasing exploitation of laborers and threats against workers for attempting to unionize in many countries, as well as increasing violence against members of the LGBT community. Smartphone-based social media such as Twitter, Facebook, YouTube and blogs played a critical role in extending the reach of opposition messages, which was validated by the University of Washington’s Project on Information Technology and Political Islam which assembled and analyzed data from more than 3 million tweets, gigabytes of YouTube content and thousands of blog posts about Tunisia and Egypt prior to the crisis in each country. 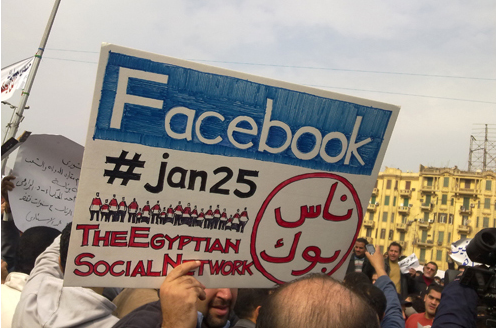 Image: Protester in Egypt holds up home-made sign at a protest rally that mentions both Facebook and the Egyptian uprising organizers’ Twitter hashtag #jan25. Inspired by the successful Tunisian Arab Spring revolution hashtag, #sidibouzid, the Egyptian hashtag #jan25 stands for January 25, 2011, the date the organizers launched the Egyptian civil uprising in Tahir Square. Photo by Essam Sharaf. But in addition to serving scholars, reporters and analysts looking at the past, Otero says the State Department uses these reports as a source of information for present and future U.S. policy making, and sees them as a way activists and policy developers in this and other countries can help their own governments identify and decrease whatever abuses may exist, while at the same time increasing their own capacity to protect and to address the issues of human rights in their own countries. It shows that there’s nothing wrong with reading about rights! HOW CAN YOU OBTAIN a copy of the two-volume set of Country Reports on Human Rights Practices for 2010? To find more U.S. government reports and publications about human rights reports,browse our online bookstore and search on “human rights”. This entry was posted on Wednesday, August 15th, 2012 at 3:49 pm and is filed under Congress, Department of State, Foreign Relations, Human Rights, Middle East, U.S. Department of State. You can follow any responses to this entry through the RSS 2.0 feed. You can leave a response, or trackback from your own site. This is good to know that the Country Reports also serve as a progress report in relation to previous years by outlining which countries are improving and which are backsliding as far as human rights are concerned. Local search engines are the best way to find the local human right organizations. Are equal to each other as human beings. And destroy each other … it is not correct. A violation of human resources. The individual Any person or group in society. With the care. 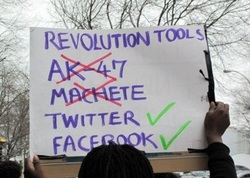 Should preserve the rights and interests of social groups such as. 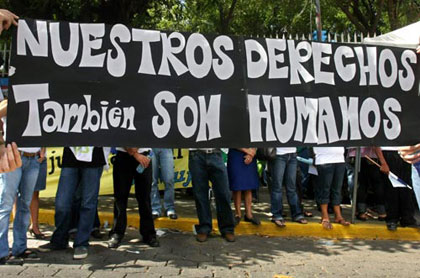 Human Rights ?. : We were Late……..
Human Rights is universal. Natural. We need many decades or two or three generations to implement it. Some reasons makes us be mistaken to interpret this goal. Sorry……. !